Starring Kenneth Branagh, Kate Winslet, Derek Jacobi, Julie Christie, Billy Crystal, Charleton Heston, Robin Williams, Jack Lemmon, Gerard Depardieu & Rufus Sewell. With Sir John Gielgud, Judi Dench, & Richard Attenborough. As very probably the only man alive today who could succeed in getting made a full-text feature film of "Hamlet," Kenneth Branagh should be thanked for his tenacity and dedication in bringing Shakespeare this mesmerizing to the screen. At just under four hours (don't worry, there's an intermission), Branagh's vaguely 19th Century "Hamlet" is vast but manageable, gorgeous, and tragic on a very personal level. And every moment is riveting. 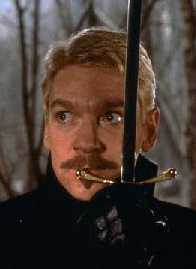 Branagh, directing himself in the title role, is impossible to look away from. A witty "melancholy prince" who isn't so mad that he cannot find humor in his circumstances, he is more obsessed than insane. Distraught over the death of his father, the king of Denmark, and the swift marriage of his widowed mother to his uncle, who then becomes king, Hamlet is awash with emotions he cannot control. The story opens with the appearance of his father's ghost, who reveals that he was murdered by his brother, which sets Hamlet on a course of grievous revenge. So driven by this obsession is he that many in the court think he's gone mad. He sabotages his relationship with his lover Ophelia (Kate Winslet), he is dubious of his friends and he eventually sets in motion a series of events that lead to Ophelia's madness, several deaths and the eventual overthrow of his kingdom. While possibly slipping into madness in fact, Branagh's Hamlet is cunning enough to also play at madness to bewilder his murderous uncle, Ophelia's father and others he does not trust. "I am but mad north-northwest; when the wind is southerly, I know a hawk from a handsaw," he declares. As a director, Branagh tinkers with some of the play's implications. He uses flashes of Hamlet's memory to establish the love affair between Ophelia and Hamlet that is implied but not seen in Shakespeare's text. It's a cinematic stroke that brings more sensual flavor to the production. These flashbacks allow Winslet to play an emotional swing as large as Hamlet's, from the joy of new love to the despair that drives her to her own madness. The chemistry between Branagh and Winslet is heated and tender, and as Ophelia, Winslet is a wonder. In fact, with the exception of a few Americans cast in walk-on roles (probably to placate the distributor's demand for marquee power), every performance is near genius. Derek Jacobi plays uncle Claudius not as a conniving, evil man, but more as a powerful royal with an ambition that buries his heart while he justifies his deeds. Julie Christie plays Queen Gertrude as a proud matron who tries desperately not to see the animosity growing between her husband and her son. Many of the names that litter the lobby card are little more than cameos, including Robin Williams, Sir John Gielgud, Gerard Depardieu and Jack Lemmon (who is simply dreadful as the guard Marcellus). But Billy Crystal is surprisingly apt as the humorous gravedigger who hands Hamlet the skull for one of the play's famous soliloquies. Charleton Heston, as the Player King, is also perfectly cast, as it is impossible to over-act his part. For the uninitiated, "Hamlet" may be confusing at first, even though it at times sounds like Shakespeare's greatest hits ("To be or not to be...," "Goodnight, Sweet prince...," et al). The delivery of the heady dialogue never quite makes the transition that allows Shakespeare's language to flow easily into the modern ear, so one has to work at listening. But Branagh's direction is strong. His actors embody their parts fully enough that The Bard's intentions are solidly founded by action, allowing the words to cement the meaning. Branagh also provides wonderful settings for the films most poignant moments. In Hamlet's "To be or not to be..." soliloquy, he speaks to himself in a hall of mirrors. The angry confrontation between Hamlet and his mother in her bed chamber is perfection. Played with alternating rage and fear, and using grainy portraits of Hamlet's father and uncle as props, it is the best scene in the film. The bed chamber itself is wonderfully opulent, as is the rest of the castle with its brightly colored halls, gold trim and checkerboard floors. The snow-blanketed gardens of Blenheim Palace in Oxfordshire are used for Hamlet's confrontation with his father's ghost and for another flashback, this time of Claudius' poisoning of the king. While perhaps not as accessible as his "Much Ado About Nothing," Branagh's new masterpiece is certainly a film that could turn the reluctant on to Shakespeare as well as a joy for nit-picking scholars. And the use of Blenheim Palace was a scouting coup, giving "Hamlet" a genuinely regal tone that adds authenticity to its classic story of a royal family unraveling.